Satisfy your craving for local delicacies like Minced Pork Noodles with Mushrooms ("Bak Chor Mee") or Fish Ball Noodles or Finger Food like Fishcake at our newly open EAT. at #01-02/03! Enjoy their Exclusive Opening Promotion here! 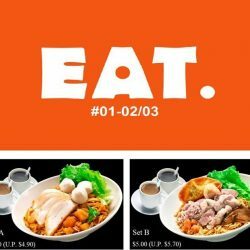 Set B: Minced Pork Noodles with Coffee or Tea at only $5.00.